Attempting to do some tidying-up here at The Cauldron, I offer you some snippets of current and fairly recent events. First, in the on-going saga of the two young Costa Mesa residents who became lost while hiking in the Trabuco Canyon area of the Cleveland National Forest on Easter Sunday, reports tonight are that one of them, Nicholas Cendoyo, has been found barely clothed and not very lucid and is being treated at Mission Hospital in Mission Viejo tonight. Hopefully, when he's able to, he can help searchers locate his hiking partner, Kyndall Jack. You can read Lauren Williams' most recent version of this story HERE. An interesting sidebar to this story is that several former members of the now-defunct A.B.L.E. helicopter program volunteered Wednesday to provide air support for the search operation. Very generous Newport Beach businessman Peter Adderton - you may recall his name from his attempt to help save A.B.L.E. a couple years ago when the Costa Mesa City Council arbitrarily decided to shut it down - offered the use of his helicopter for this mission. Former A.B.L.E. pilot Rob Dimel reports that his crew spent more than 3 hours in the air Wednesday in a support role and are ready to launch again tomorrow if needed. Kudos to Adderton and the pilots for their spirit of volunteerism in support of our community. Today, Thursday, the 60th Anniversary Committee meets at 5:30 in the Costa Mesa Police Department Emergency Operations Center to discuss the progress being made for the various events that will make up the celebration. You can read the agenda HERE. The pubic is welcome to these meetings. 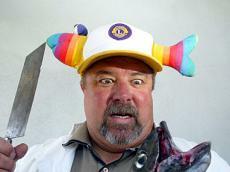 On a semi-related note, last week Daily Pilot columnist Jim de Boom wrote in his column, HERE, about the generous contributions made by the Costa Mesa Newport Harbor Lions Club as a result of last year's very successful Fish Fry. Lions Club President Mike Scheafer - who also heads up the 60th Anniversary Committee - announced that more than $28,000 was distributed to three dozen organizations in our community. Kudos to the Lions Club for their efforts. This year the 66th Annual Fish Fry will be held, again at Fairview Park, on the weekend of May 31 - June 2nd and will include the Community Run as one of the events for the first time. You can read about it HERE. Finally, the City of Costa Mesa, HERE, continues to pitch the up-coming Mayor's Dinner and encourages you to open your checkbooks and fork over $125 for a ticket - $5,000 for a table of ten. We're told there are still some space available. You can read more about it at the official website, HERE. I don't want to put a damper on this event, but it seems to me that Mayor Righeimer is just trying to pretend he's in Newport Beach. And, I'm sorry, but I can't stifle a smirk when I think of the theme of this event - "The Art Of Leadership". Yeah, I know - the proceeds of the event will go to local arts programs for high schools and other worthy art organizations. I know this is going to be a wonderful, very worthwhile event, but I sure hope they import someone to speak on the subject, because the past two years have demonstrated to me that our mayor has no clue. Anyhow, pony up, get out your party clothes and have a good time. west has a grudge that he cannot let go. it seems most blogs are like that. and they all seem to be leftist leaning with hater followers. no good deed goes unpunished here. Yet you come on here just to point that out. Seems the Riggy lovers just can't stay away from West's blog. "west has a grudge that he cannot let go. it seems most blogs are like that. and they all seem to be leftist leaning with hater followers. no good deed goes unpunished here." And in your golf cart world, no boot goes unlicked. It must be tough only getting a 2 year term (gift). You might have to work harder after the boys abandon you..
Riggy has had grudge against public employees for 20 plus years. It seems that most low-level, local, and corrupt politicians are like that. They all seem to be leaning a little hefty these days and always with a group of mindless followers. No Riggy deed goes unwatched here. I am moved by how well this community is coming together in support of its own: from the search efforts to the Fish Fry and the Lions Club. It's heart warming. No, this requires intelligent people and unites a diverse group of folks with real troubles that cannot be solved in 30 minutes. I am moved by the reality not the fantasy you seem to aspire to. I chose to move to this city because it is a real cross section. If I wanted the white wash that was Mayberry, I would have chosen Irvine. Do you think in Mayberry they called their law enforcement Union Thugs? Where do the Hispanic football players live in Mayberry? I will gve them a couple of likenesses though, like Fitzpatrick as Goober, Monahan as the town stooge or drunk and there really are several Barney's in their group. The atmosphere in Costa Mesa the new OCGOP people have created isnt anything like Mayberry. What it is is these guys trying their best to put lipstick on the pig they created. They have caused so much divisiveness they need to try to cover it all up. If they can get enough people to buy into the whole we are like Mayberry thing they have covered their bull crud. Mensinger does kind of look like Aunt Bea. The real question is do you think these guys have actually convinced themselves Costa Mesa is like Mayberry? If so what does that say for their mental state? "..these guys have actually convinced themselves Costa Mesa is like Mayberry?" They want it to be just like their true preference, Newport. Newport gives out mayor's awards and has lots of dinners; Newport has a coffee shop at city hall, Newport is where Riggy and Baugh office together. Someday Mensy might increase his income and move to Newport. That would be good. Mary Ann: Irvine is whitewashed? lots nof persians and asians there. Early Meeting? Not A Chance!